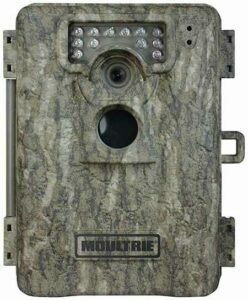 Moultrie continues to bring in new innovation and features to the world of trail cameras. The well-known brand introduces the Moultrie A8, a new addition to their model cameras. It has lot of features that will surely set you up for a successful scouting. The Moultrie A8 is like the big brother of the Moultrie A5. It has an 8 MP resolution that will give you high-quality photos. It also has a mossy oaks bottomlands camouflage and a low glow infrared technology that will make it undetectable by anyone and anything around. Everything to make sure you find what you are looking for on those scouting expeditions. One good thing of this camera is that it has really good features but it is not expensive unlike other trail cameras. If you have vast lands to manage, then buying a few more pieces of this will not cost you a lot compared to buying one piece that is more expensive like the Reconyx HC600. This camera will do an efficient job for a good price. The downside of this is that it has a slow recovery time. This may be an issue especially if you are scouting game involving speed and swift movements. This camera is more ideal if you are using it for monitoring lands and plots. The night photos are also not of good quality especially if the object is beyond 20 or 30 feet of range. It is something that could be expected, though, especially for the price range of this model. All in all, the Moultrie A8 is a respectable camera. It is a good value for its money’s worth so you can be sure that you expenditure will not be put to waste. I just have to mention that if you feel like the A8 just doesn’t feel right, you have to check out my Moultrie 990i review.